If VC-3 has MEK, how can it be plastic compatible? There are two ways to approach the use of VC-3 when discussing plastic compatibility. If you apply VC-3 directly to a plastic fastener, there is a limited selection of substrates which are compatible. Please review the table here as a start, and be sure to test first. The second way to use VC-3 is when you are installing a metal fastener into plastic. Because VC-3 must be dried first, all the solvent will have evaporated and you should be left with an inert plastic threadlocker. You can then install that fastener into practically any type of plastic assembly. Where are some of the places I can use VC-3? VC-3 is extremely versatile. It can be used in applications ranging from automotive, motorcycle, home repair, sporting, firearms, R/C, and more. What is a Thread Locker? Threadlockers are materials which are applied to threaded fasteners to prevent them from loosening. There are many different types, but typically they fall into three categories; anaerobic locking, vibration dampening, or prevailing torque generating. Anaerobics are applied to fasteners, then installed into a mating part (typically metal) which causes it to cure and lock in place. Vibration dampening compounds are applied to the fastener then dried. Once installed, they act like a shock absorber, isolating the fastener movement from the assembly and preventing it from losing clampload. The final type is prevailing torque, and is typically though pre-applied displacement materials such as nylon which are adhered to fasteners at a processing facility. They create a wedge force on one side of the fastener, increasing metal to metal contact 180deg opposite, which increases friction and greatly reduces the movement of the fastener. Where can I download the Vibra-Tite logo? Click here for an EPS file. Click here for a PNG file. Two conditions must be met for an anaerobic material to cure. 1) Absence of air. 2) Contact with metal ions. Loose fitting parts along with non-reactive metals like stainless steel can reduce a products’ effectiveness. In some cases primers can be used to counteract these negative effects. Once applied to a metal part and installed, the material begins to harden due to an absence of air. Over time the anaerobic liquid cures to a tough 100% solid thermo-set plastic, locking and or sealing the part in place. Why are anaerobic bottles only half filled? Anaerobic products such as threadlockers and retaining compounds cure in the absence of air. It is necessary to have a sufficient volume of air within the container to prevent the product from hardening. How do I know which product I need? If you need assistance choosing a product, please fill out our product inquiry form. Our R&D Department will review the answers you provide and recommend the appropriate products. As a vertically integrated company we are able to control overhead in all aspects of manufacturing. From R&D, to chemical blending and bottling and packaging services, we do it all. Can I have a material custom formulated to meet certain specifications? Yes. Because we have our own R&D and Chemical blending divisions we are able to formulate products to your specific needs as long as the volumes meet our requirements. Please contact our Vibra-Tite sales team to discuss the program. Where can I purchase Vibra-Tite products? Vibra-Tite products can be purchased through an industrial distributor, online, or directly from us. 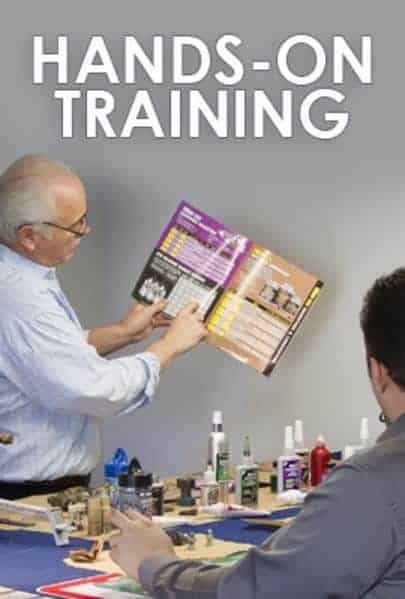 Who are your approved distributors? For information about your nearest distributor, please contact our sales team. 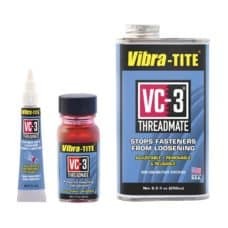 Can I apply a new coat of VC-3 on top of a previously removed fastener with VC-3? Yes. The solvent in VC-3 will re-liquify and adhere to the existing material on the fastener. After drying for 10-30 minutes the fastener is once again ready for use. How can you remove excess VC-3? MEK or some paint thinners which contain MEK are best for cleaning up spilled or excess VC-3. Be sure to use the proper safety equipment such as gloves, mask, goggles and ventilation. Can the drying time of VC-3 be decreased? Increased air flow will help to decrease drying time. We do not recommend the use of a heat source as the solvent in VC-3 (MEK) is flammable. What is the drying time of VC-3? The drying time of VC-3 varies depending on how much material was used. If coating a large fastener with deep threads, it may be necessary for the part to dry up to 30 minutes before use. We recommend at least 10 minutes for most parts. Vibra-Tite VC-3 passes NASA spec sp-r-0022a for outgassing properties. What are the differences between each VC formulation? The solvent in VC-3 is MEK, VC-4 contains Ethyl Acetate, VC-5 contains MPK, and VC-6 contains Dimethyl carbonate. How can VC-3 lock a fastener in place if it can still be easily removed with hand tools? Unlike a traditional threadlocker which attempts to fix a fastener solidly in place; VC-3 works on the principle of vibration dampening. VC-3 essentially isolates the fastener from the vibration of the assembly, absorbing any intense shock and vibration which keeps the fastener from rotating. However, when you try to remove a fastener coated with VC-3 with continual torque in a singe direction, because of VC-3′s viscous flow properties, it will eventually rotate out. But this action is not representative of vibration in a real use situation where the direction and velocity is of a more random pattern.